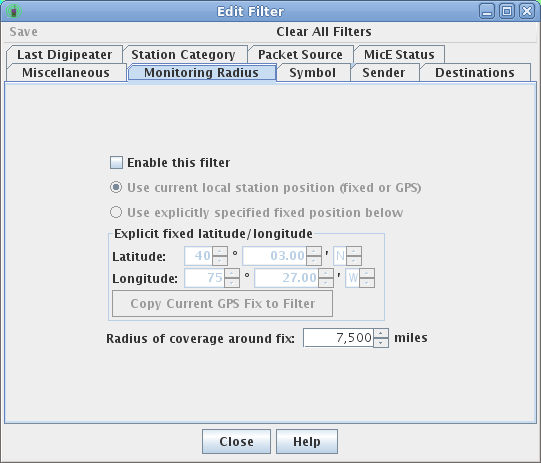 The Radius filter allows restricting views to an area within a center latitude/longitude point (current station location, current map center, or an explicit position) and radius therefrom within the sending station or object must be located. A button is provided for conveniently copying the current GPS coordinates to the center point. The default radius is set to 12,000 kilometers (so that no actual filtering should be done unless the radius is lowered). Note that this filter has nothing whatsoever to do with a radius filter specified on an APRS-IS connection. The APRS-IS filter restricts which stations you will hear; this filter restricts what subset of the heard stations you will see.